Adding storage to a bathroom doesn't just mean, cabinets or cupboards. Adding shelving can make an area usable but also stylish. But don't add too much clutter. I love wire baskets, you can get hold of these in loads of different sizes. 2. Wooden crates, again there are many different shapes, sizes and colours. 3. Solid wood shelves. Add these above the toilet. make the most of the wall space available. When designing your bathroom think about the space available. I love this as your not losing any space at all. Far better than trying to find a shelf in a shower that can with stand water constantly. Im sure im not the only one to try the metal shower racks to store shampoos on, that are either free standing and eventually rust or even worse the ones with the suckers that are meant to never come off? then suddenly drop to the floor and chip your lovely ceramic shower tray. So to me this is a genius idea. 5. Free standing ladder shelf. 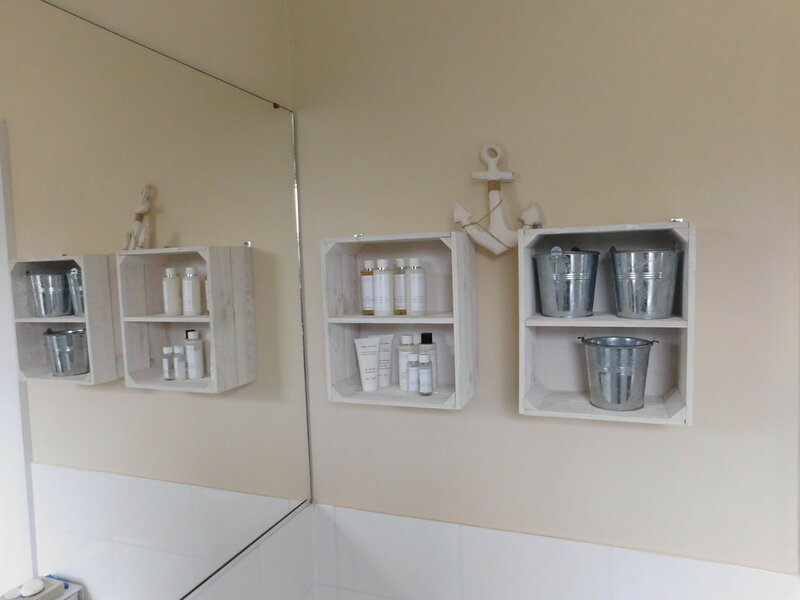 Finally if you have a large bathroom then why not go for a free standing shelf. With these your free to move them around if you get bored. If your anything like me I'm forever changing furniture around.